How do I see an Urban Exchange Apartment? The Urban Exchange is 100% occupied throughout the year so we must give our tenants 24 hour notice before showing an apartment. If there is availability in an apartment, please be sure to email us at Mary@LiveUE.com or Info@LiveUE.com to allow us time to set up an appointment for you to see that available unit. We have four show units available from the hours of noon until 5 pm, Monday through Friday during the fall leasing season. This phase of leasing season starts in the first week of October and continues through the month of April. The best policy is to set up specific times to see the show units but if you have time, feel free to just stop by for a tour. All security deposits/fees will vary based upon the floor plan chosen. Please check in with your Portfolio Manager or Assistant Portfolio Manager for the exact amount that will be due at the lease signing. Please know that all security deposit/fees will be payable at the lease signing and can only be paid in check, money order or cashier’s check. 1. Application – The application fee is $35, paid for with debit or credit card when applying online. Once you have finished your application, email Mary@LiveUE.com to let her know you have submitted your application to ensure the apartment is saved for you. Apartment Choice – With our wide variety of floor plans, if you have a choice of a floor plan or unit number, identify that on the first line of the application, “where do you want to live?” so we can try to save that particular apartment for you. Roommates/Occupants – Indicate all of your roommates or significant others on the application under “roommates/occupants” so we can begin preparing the lease. 2. Signing Appointment – Once an application has been received and approved, a lease appointment must be made within one week. Let us know a date/time that works for all of the roommates/occupants to be present to sign. Your apartment is only reserved for that one week. If you do not get the lease signed within that one week time period, the apartment will be available to anyone else interested in living at the Urban Exchange. 4. What to Bring – You will need to have a driver’s license, passport or state issued photo identification card for us to make a copy. We cannot accept a JAC card as a form of ID. You will also need to bring your check or money order for the security deposit/fees. Security Deposit/Fees – Checks and money orders need to be made payable to Matchbox Realty and the amount to be paid varies per apartment. Please email Mary@LiveUE.com before arriving for your lease signing and she can give you the amount due. If you have questions about renting an Urban Exchange apartment, or if you are ready to submit your completed application, please contact us at either Info@LiveUE.com or 540-705-0652 . Internet, trash and recycling are included in the rental rate at the Urban Exchange. The averages that we have seen (based upon double occupancy), have been about $14 per person for water and about $25-30 for electricity. As with any utility, this is based upon your own person usage. The averages could be lower in the Fall and Spring but a higher in the Winter and Summer. Again, these are just averages. Where do I park at the Urban Exchange? The Urban Exchange features several parking options for tenants. There are two underground parking garages (P1 and P2) available for rent. Tenants can rent a guaranteed space (unassigned) for $40 per month for the full duration of their lease. Directly in front of the P1 entrance is a small, unmarked lot is available to tenants but is not guaranteed. At the intersection of Ott and Water St., this lot is permit parking only at no cost to tenants. 2 hour street parking managed by Harrisonburg Municipal Services. If you are visiting the leasing office or making a quick trip into the buildings, Water Street in front of the leasing office is the ideal area to park if spaces are available. You do not need a permit to park here, but adhere to the city parking signs to ensure you are not ticketed. Downtown Harrisonburg Municipal Parking spaces/lots. Parking downtown is enforced on the 7-7-6 Plan: 7am to 7pm, 6-days per week. Enjoy evenings, Sundays and holidays without restrictions. Visitors, please do not park in any of the Urban Exchange tenant parking lots. These are towable lots and we do not want to see you inconvenienced with your time or finances by parking in these parking lots designated for our tenants. Is there a bus stop at Urban Exchange? Harrisonburg Department of Public Transit provides free transport with the numerous bus stops found in and around downtown. Around the Urban Exchange there are two bus stops available. One beside Three Notch’d Brewery on East Market Street and the other is across from Benny’s Pizza on South Mason Street. For more information regarding Harrisonburg Bus Services and schedules, visit Harrisonburg Public Transit Bus Services. We love pets and we know that YOU love your pets, but please understand that having a pet at the Urban Exchange and any of our communities is a privilege and not a right. You must be able to take the ownership of your pet very seriously just as you would take on having a child of your own. Your pet deserves your time, your love, your attention and your leadership. Please know the rules of pet ownership before you decide to bring one into your life. What are joint & individual accounts? 1. If ALL Guaranties of Lease are returned to Management prior to commencement date of your lease, each tenant is responsible for a proportionate share of all amounts due under the lease (versus joint liability for the full 100%). 2. 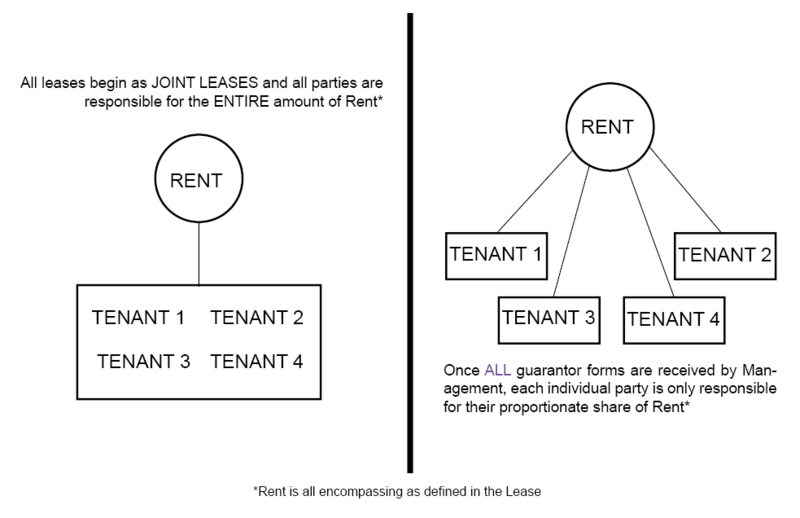 If NOT ALL Guaranties of Lease are returned to Management prior to commencement date of your lease, all tenants are jointly and severally responsible for all amounts due under the lease (versus liability for your proportionate share due). How do I apply and sign a lease? Application – The application fee is $35, paid for with debit or credit card when applying online. Once you have finished your application, email Mary@LiveUE.comto let her know you have submitted your application to ensure the apartment you are applying for is reserved for you. Apartment Choice – With our wide variety of floor plans, if you have a choice of a floor plan or unit number, identify that on the second line of the application so we can try to save that particular apartment for you. Signing Appointment – Once an application has been received and approved, a lease appointment must be made within one week. Let us know a date/time that works for all of the roommates/occupants to sign the lease. Your apartment is only reserved for that one week. If you do not get the lease signed within that one-week time period, the apartment will be made available to anyone else interested in living at the Urban Exchange. What to Bring – You will need to have a driver’s license, passport or state issued photo identification card for us to make a copy. We cannot accept a JAC card or and other student identification as a form of ID. You will also need to bring your check or money order for the security deposit/fees. WE CANNOT ACCEPT CASH UNDER ANY CIRCUMSTANCES. Security Deposit/Fees – Checks and money orders need to be made payable to Matchbox Realty and the amount to be paid varies per apartment. The normal formula will be APARTMENT RENT+$76/NUMBER OF TENANTS= TOTAL AMOUNT OF SECURITY DEPOSIT/FEES PER PERSON. Please email Mary@LiveUE.combefore arriving for your lease signing and she can give you the amount due. How Do I Secure Underground Parking? Your parking choices are chosen at the lease signing. If you choose underground, interior parking, the parking is a monthly rental rate and will be for the term of the lease. The spaces are not reserved but you are guaranteed a space within the garage. If you did not choose interior parking at the lease signing, you can be entered into the parking lottery. The parking lottery starts around September 1 and the premise is where we open up any extra parking spaces to those that are interested in them. We will send out a mass email to everyone and anyone that is interested can respond. The first ones to respond via email will secure their space in the garage for the going rental rate. Directions on the parking lottery always go out towards the middle of August. Are There Time Where You See Issues With Parking At The Urban Exchange? Sure. Be prepared for parking overload in August. This is right before school starts and everyone is moving into their apartments. Every mother, father, brother, boyfriend, moving truck, van, etc. is helping their family member move into their apartment. Parking will be a hot commodity on the exterior of the building during this time period. Please just follow the signage on the exterior of the building to avoid tickets of towing and come with patience. Once school starts and everyone goes back home—normalcy settles in and parking is back for all to enjoy. How Far Is It To JMU Campus from the Urban Exchange? To the center of the Quad, you are talking about a 12-minute walk. On bike, about 4-5 minutes once you get out onto the road. The greatest feature, though, is that the entire commute is on flat level land and you will be traveling through our historic, downtown Harrisonburg. Our commute is no different than any other side of town, we are just on a side of campus closest to Forbes Center, Memorial Hall and the Student Success Center. At the Urban Exchange, the parking garages have vertical and horizontal bike racks for your bike parking conveniences. You will need to bring your own lock but your bikes will stay dry in the secure, underground parking garage. Please be sure to get a bike pass before storing your bike in this location. Only tenants are allowed to have their bikes in the garage so please have your guests use the bike rack on Water Street closest to the entry stairs. If I Signed A Lease At The Urban Exchange, What Would The Estimated Utilities Cost? Based upon double occupancy, the averages that we are seeing in 2017, is about $14-15 for water and about $25-30 for electricity. Please know that this is an average so depending upon your personal usage, the rates could be higher or lower. No. We do not have fuel burning appliances, gas or pilot lights so you do not need one in the Urban Exchange. All of our appliances are electric. What Is The Internet Speed At The Urban Exchange? The internet speed currently at the Urban Exchange is 10 mbps. This speed has been perfect for streaming HULU and Netflix, etc. If you feel you need more, you may certainly purchase a larger plan through the service provider which is High Speed Link (Hyperlink) or any other local provider of your choosing. Is Internet Wireless In My Apartment? The internet is provided through Ethernet ports in your apartment. Each room has two Ethernet and two cable jacks. If you would like the apartment to have wireless, you will just need to have one wireless router in the apartment. This router is not provided and will need to be brought with you. Each apartment has a maximum number of pets. This is not a per person maximum but an apartment maximum. The apartment maximum is set at a total of two. Again, there is a weight and breed restriction so be sure to chat with your Property Manager before falling in love with a new pet.